The Jawbone UP is Jawbone’s answer to the popular Fitbit fitness monitoring product line. This water-resistant product is worn around your wrist and will track not just your steps but your sleep as well. With a variety of colors and sizes this is not only a fitness monitoring tool but a great accessory for you and your iPhone. The 10-day battery means you don’t have to take it off to charge very often. The UP measures yours steps throughout the day though has a problem with movement that doesn’t involve the wrist such as biking or an elliptical machine. You can add those movements manually to the app or put the device in your pocket. Although it’s water resistant, Jawbone advises against wearing it while swimming or in a long hot shower because long term water contact can cause problems. My first one had a problem potentially with overflexing the band to fit on my ankle and I was warned the electronics are throughout the whole band and can be damaged. The UP also measures your sleep quality and will let you take a power nap or set vibrating alarm and be woken up in an optimal time so you aren’t in the middle of a deep sleep and are jarred awake. This is a great feature for those who have trouble getting up in the morning, although I didn’t notice much of a difference but to be fair I’ve tried other products like this without much success as well. The way you read the data is through the iOS app and you must plug the device into the headphone jack to get a full read. It does not sync via Bluetooth or a computer: a smartphone (though not an iPhone) is required to analyze the data. Fortunately syncing only take a few seconds so it’s not a big deal. The food tracking capability of the iPhone app is amazing. Not only does it have an extensive database of foods but it also allows you track food via scanning bar codes or taking pictures. No excuses for not watching what you eat. With all this data of how you move, what you eat and how you sleep, the app offers insights and observations to improve your health and lets you analyze this data on your own to see trends how lack of sleep might cause you to overeat or not exercise enough. Impressive information for those trying to improve their health. Built into the app is a team function in which you can work with others to compare fitness goals. Personally I couldn’t find any friends using the Jawbone UP to compete with (although I had dozens of friends using the Fitbit). Similar to many technology products, it’s about an installed base. 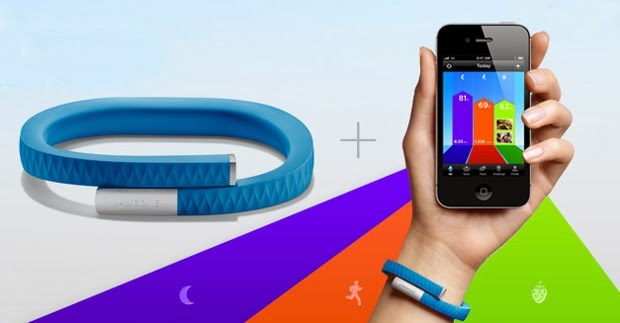 Fitbit got to the market first with the products and have a large group of users who continue the momentum of the product. Tides easily turn. so it’s unclear who will win this war. If competing with others is important to you, be sure other friends have an UP first.